Place the chips in a suitable dish or baking tray. Cover with half the cheddar cheese. Spread the chopped tomatoes over the cheese followed by the steak. Scatter over the Feta cheese and the rest of the Cheddar and Mozzarella. Sprinkle over the sliced chillies and place under a hot grill until the cheese is melted and gooey. 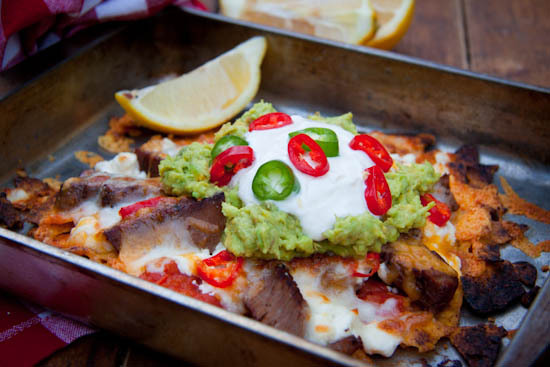 Serve immediately with a dollop of guacamole and sour cream, a scattering of extra chillies and a wedge of lemon.